On Friday, March 4, I had finished teaching in UNCG's executive education program about 2 PM. As I went to my car to drive home to Chapel Hill, I realized that the sky was full of beautiful, low-lying clouds that were producing diffused light. I love such clouds. They add depth and often drama to photographs. Rather than drive directly home, which takes about an hour, I decided to take back roads that meander through surprisingly rural farm areas south of I-85/I-40. 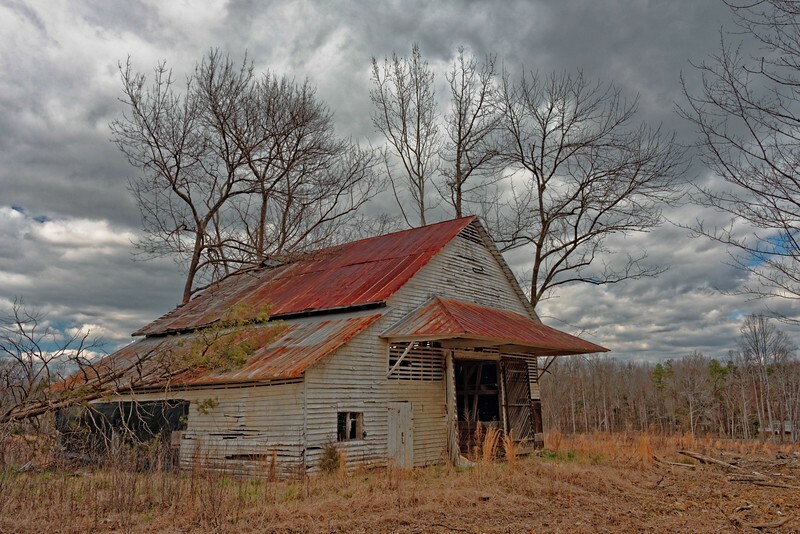 About three hours later I had taken about 100 pictures of old or abandoned farmhouses, barns, and other such things. These subjects fascinate me. They bring such rich colors and textures. Moreover, they tell the stories of families that lived and worked on these farms. Many farms are abandoned as the children escaped the farms for city life. Later the family could not afford to maintain the farms and often have just let them go. However, these farms are from where many of us came. They are our history, our heritage. I hope my pictures capture some of that history and beauty and preserve those memories. Take the long way home." How often we take the short way, the routine way, the unthinking way home -- never bothering to see the world around us and how it is changing or to feel and experience the world around us. These pictures are examples of the beauty, the colors, the sadness, the changes I would have missed had I taken the road more traveled. I hope you will find time to take the long road home.